Posted by Jon in NECA, News, SDCC 2018 with 2 comments. So who else is really excited to get an action figure of the director of Iron Man 3? 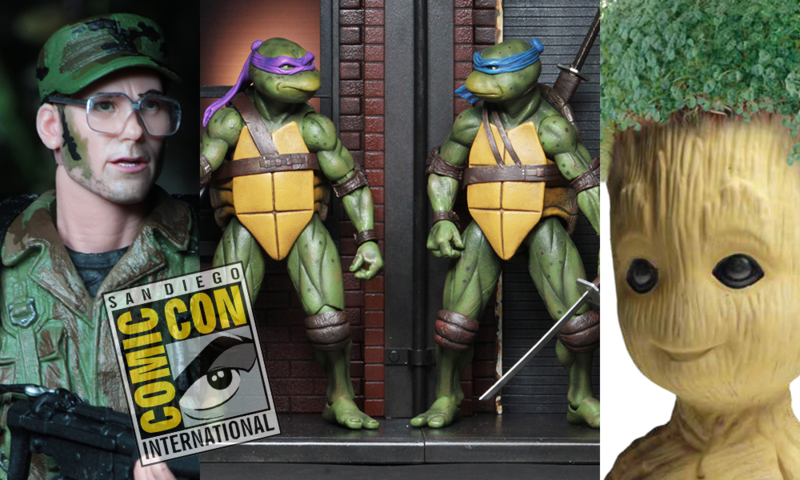 NECA has officially announced their full lineup of San Diego Comic Convention exclusives for 2018. Allotments of these exclusives will be made available (if you have a United States address, sorry International friends) online at NECA’s online store daily from June 6 – 8 starting at 1PM EST each day. So, if you aren’t attending the show you have still have a chance at these. You will pay at the time of the order, and the figures are expected to start shipping about a week after the convention. Of course, they will also be available at the NECA booth at SDCC in July. I have to assume that most people thought the 7″ scale movie TMNT figure set was a forgone conclusion, especially with the quarter scale releases being complete. NECA is giving us two options with the cheaper set just including the turtles, but the more expensive one including a TMNT themed street diorama. I’ll definitely be camping the NECA store next week. Now to decide if I want the dio set or not. Decisions, decisions! I don’t think he’ll be too hard to get. Arnold in the red polo sat around on the site for quite some time last year, the TMNT stuff is still the big fuss. I want him, but at the same time I don’t. I’m not really collecting Predator stuff anymore but owning a Shane Black toy is pretty neat.